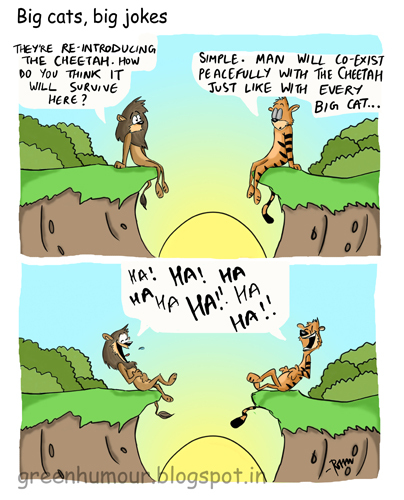 Green Humour: Big Cats, Big Jokes! While India's big cats continue to suffer from habitat loss and poaching, there have been plans by the government to re-introduce cheetahs in the grasslands of Western and central India. Does India have the room, resources and the skill to host another beautiful big cat when all its other species are already fighting a losing battle? Also, the continuous decline in the numbers of the Great Indian Bustard, a critically endangered grassland bird proves that grassland conservation has always taken a back seat in India's conservation strategies. Here's my take on the cheetah introduction issue. I just wanted to know how do you bring the cartoon look to the colours and lines . can you suggest me some software. i use a pen tablet and adobe photoshop. u can use the brushes and various blend modes in adobe photoshop to bring about the desired look. hey Rohan, this is amazing :-). with you totally on this one.you read my thoughts on the cheetah issue? Hey rohan, too good a satire i will say..!! seems Co-exist term has become so cryptic and satirical for human actions. I think i should visit ur blog very often...! Hi Rohan. Liked your cartoon which sums up the situation absolutely in your first frame itself!! Very well said Rohan!!! Great visualisation!!! Okay, I actually laughed out loud! Brilliant execution Rohan - as always!